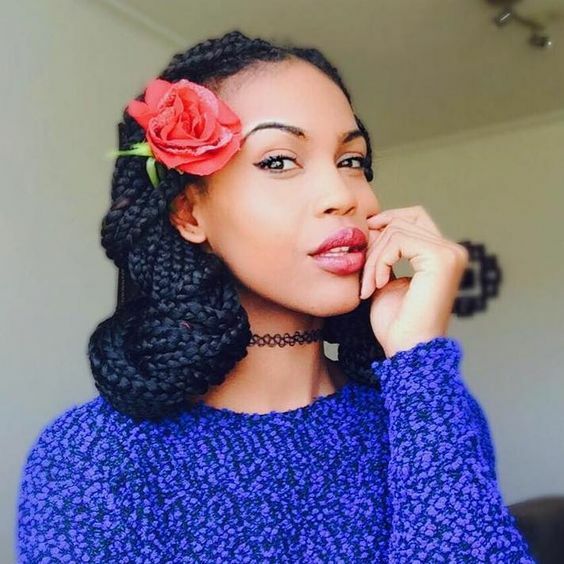 Elegant updos are crafted from beautiful braids. Creativity and innovation shine through each new up-do you create. Exciting, original hairstyles are created with up-dos. Ultra-chic ‘dos go hand and hand with maxi dresses. 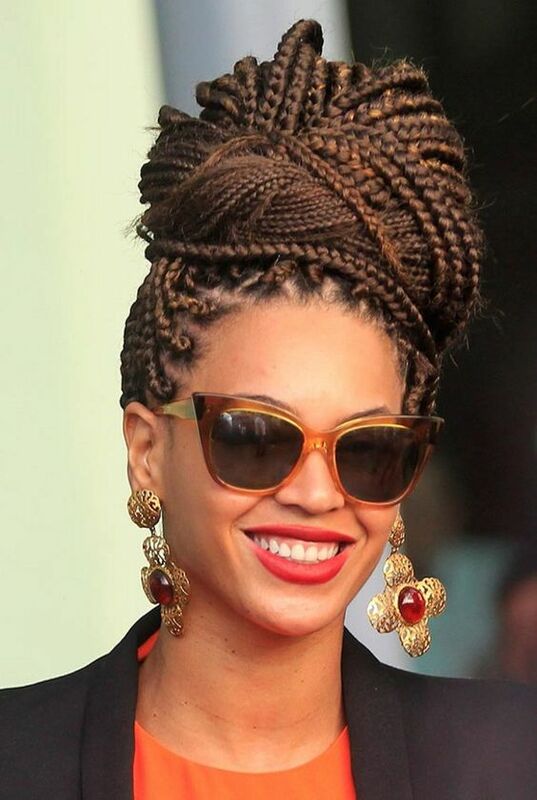 Put on your favorite dress as you check out these 40 trendiest braided updos. A braided crown is a wonderful ‘do to wear each day. Achieve an ultra-chic look through effortless style. 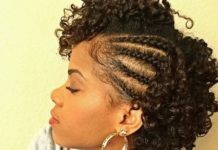 Part your tresses down the middle and create two French braids. 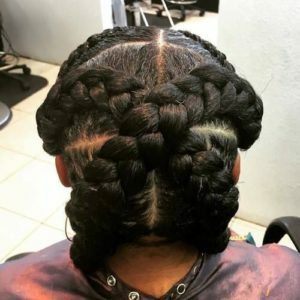 Join the braids together, and you are stylin’ in no time. A modern look is crafted when you pair cornrows on your crown and a braided bun. Shiny tresses will gleam with beauty as you don a high bun. Elegant gowns pair well with this ‘do. 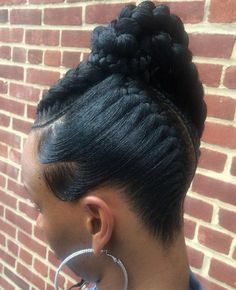 A cornrow ponytail is a wonderful protective style that does not pull on your edges. This classic, casual up-do is perfect for any occasion. Enjoy a day by the pool or a night at the hippest club. 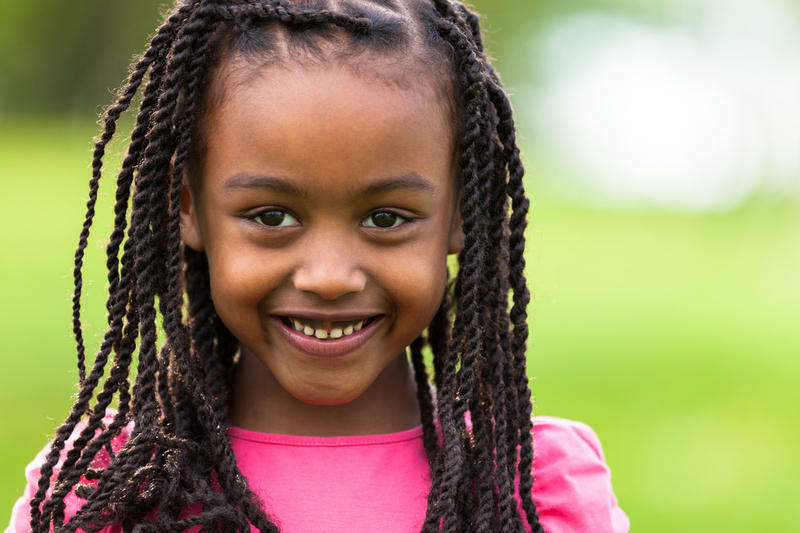 A softer, more delicate look is created with box braid pigtails. 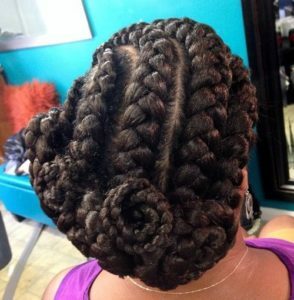 This braided up-do has a romantic appeal. 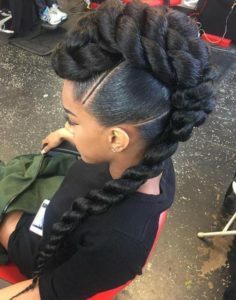 The braid stops halfway down the middle, and the ends are wrapped through the braid. 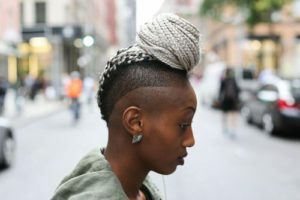 This Mohawk is one of the most creative hairstyles by far. A voluminous braid is crafted down the center of your crown. A Mohawk lets you showcase a beautiful pair of earrings at nighttime events. 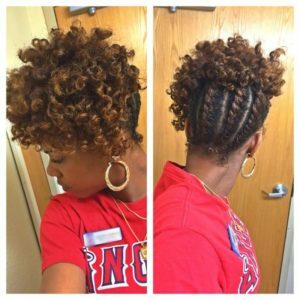 Allow your inner goddess to shine through as you don an innovative criss cross braided ‘do. Accurate parting and laser sharp styling contribute to a modern hairdo. 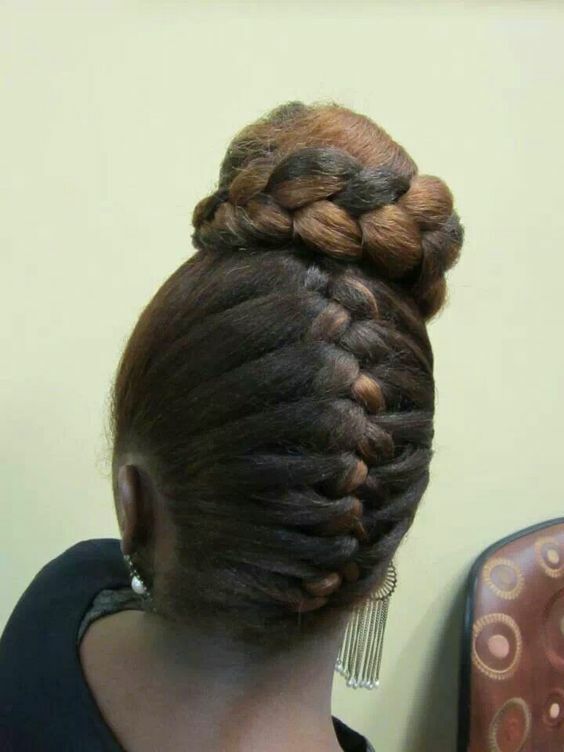 For the next formal event you attend, don this neat up-do. 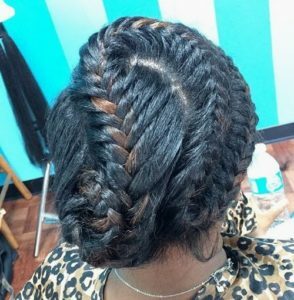 Mixing braids of various sizes creates a fashion forward ‘do. 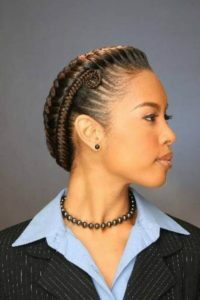 As you don your fanciest attire, this braided up-do will match the sophistication of the evening. A magical hairdo is crafted with a lovely white side braid. 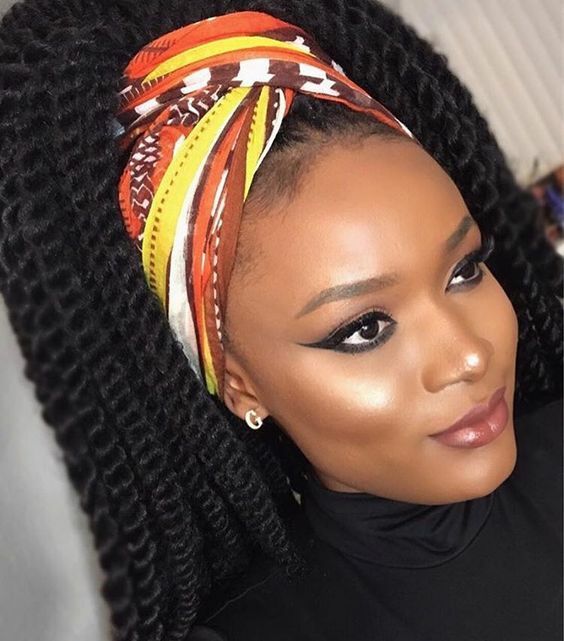 Adding unique colors to your tresses can create a whole new hairstyle. White tresses are a hip look to don. For a gorgeous protective hairstyle, look amazing with this whirlpool up-do. 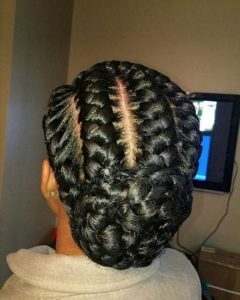 Tresses are parted diagonally, and a braid is started at one ear whiling wrapping around your head. 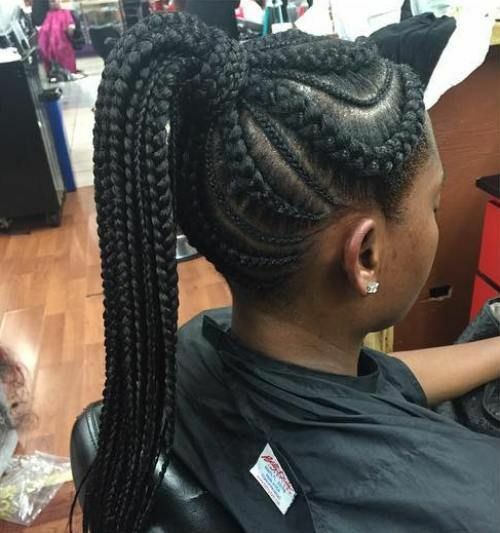 Your friends will ask you to braid their hair. A beautiful, creative up-do is styled with curves and twists. 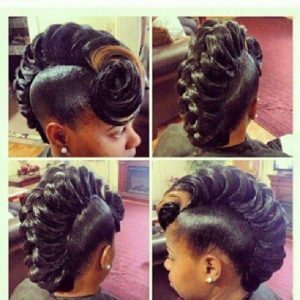 For a hairstyle second to none, this innovative ‘do will allow you to stand out from all the rest. This is a great up-do for summer days by the pool. Pair braids with bouncy curls for a cute, spunky look. 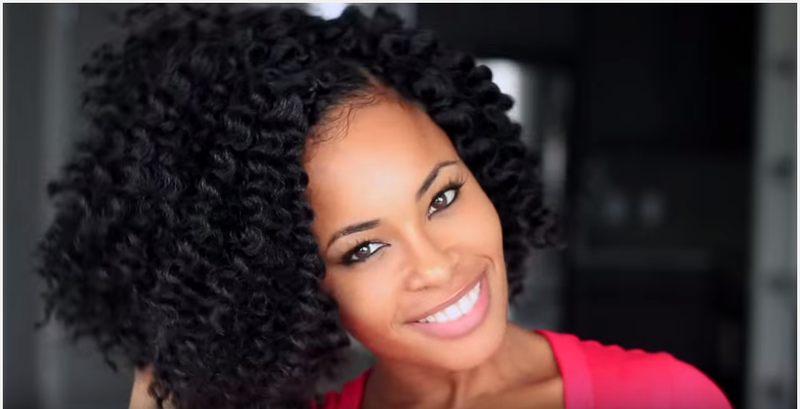 Braid your tresses in the back while the front of your hair is adorned with bouncy curls. Short to medium tresses are perfect for this ‘do. 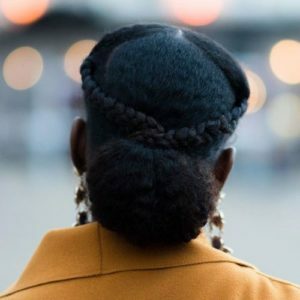 A retro pompadour is crafted with long braids. Braid your tresses backwards, from back to front instead of front to back. 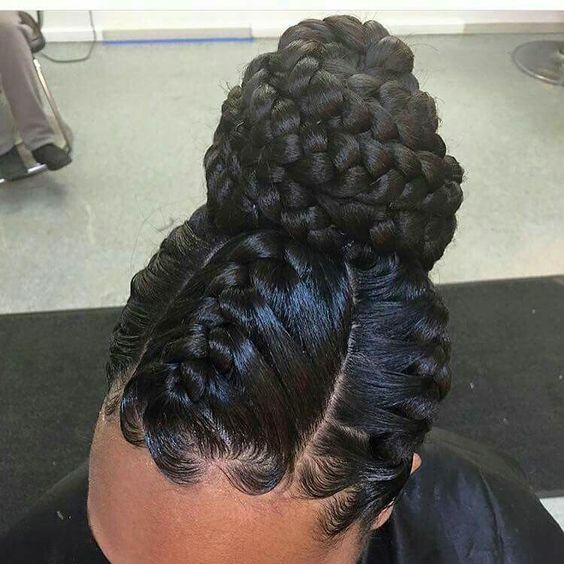 Fold the braid over, and clip the end on the bottom. Glamorous looks are skillfully crafted with long braids. 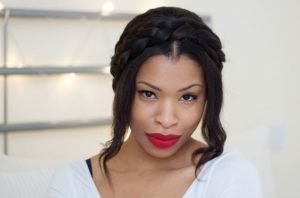 Milkmaid braids are a classic ‘do that will never go out of style. Pair your beautiful attire with this sophisticated look. Dutch braids are coiled into side buns for a cute, fun look. 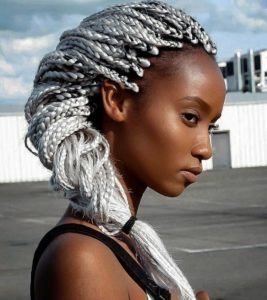 For those with an adventurous spirit, this hairstyle fits your unique personality. Don this ‘do on hiking or camping journeys. 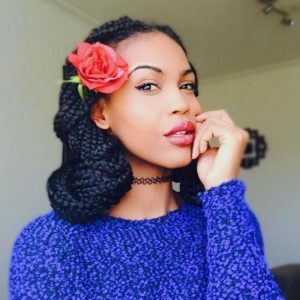 These French style braids are always in fashion. A chic, stylish up-do is skillfully crafted with a gorgeous braid. 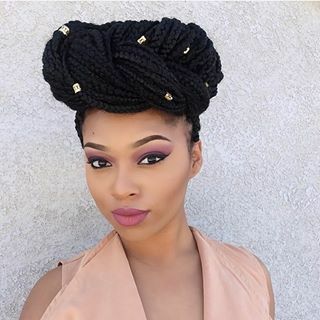 The braid starts at your bangs and gracefully wraps around your crown. If you desire a look with edge, don a high bun paired with shaved sides. 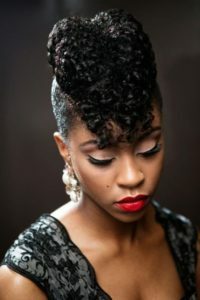 A modern look, the shaved sides allow you to have neat, sharp designs throughout your tresses. 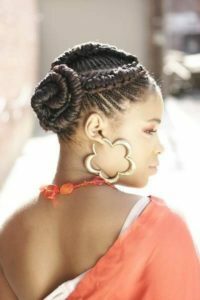 A braided chignon up-do is an excellent style when transitioning from processed hair to natural tresses. A sleek up-do is taken to a new level when you add color to the braid. 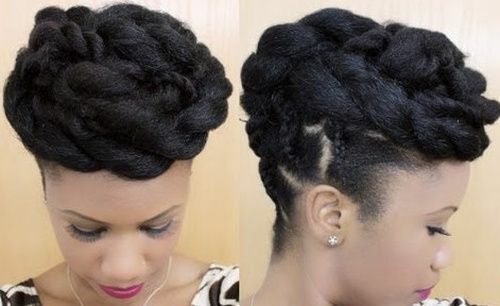 Style your tresses into numerous French braids and then craft an elegant low bun. The braids are combined and coiled together. Pair this ‘do with fancy cocktail dresses or sophisticated business attire. 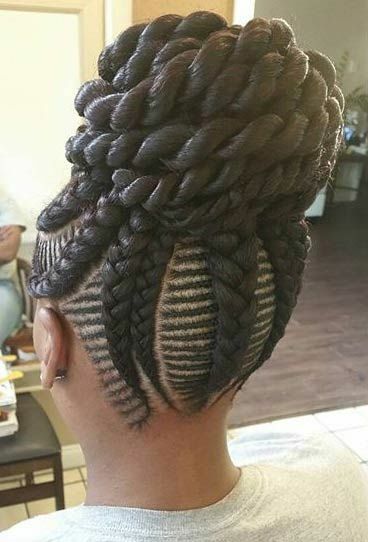 This ultra-chic braided Mohawk has a perfect shape, reminiscent of a seahorse. For those daring enough to wear this ‘do, pair it with stylish earrings and an elegant cocktail dress. You are sure to turn heads everywhere you go. A simple side ponytail is an effortless way to keep your tresses off your face. 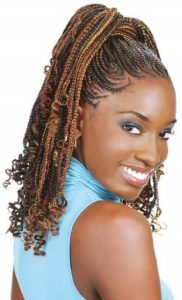 Braids are pulled back and secured with an elastic. 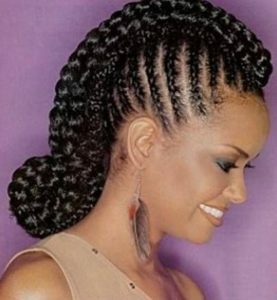 Allow your braids to cascade down the front of your shoulders for a simple, yet beautiful look. Up-dos are wonderful styles for adding various colors. 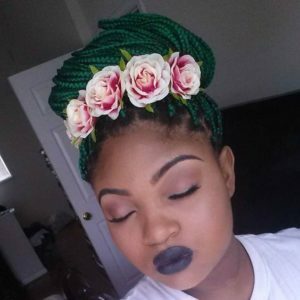 This green braided up-do is unique and innovative. The high bun paired with floral accessories creates a softer, more feminine vibe. A completely new up-do is created when braids and twists are paired together. This exciting up-do combines a fauxhawk with a bun. As you dance the night away, this fabulous style will stand out. 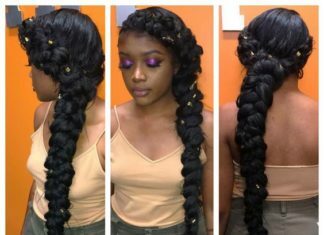 Goddess braids are styled into a fancy, high fishtail. 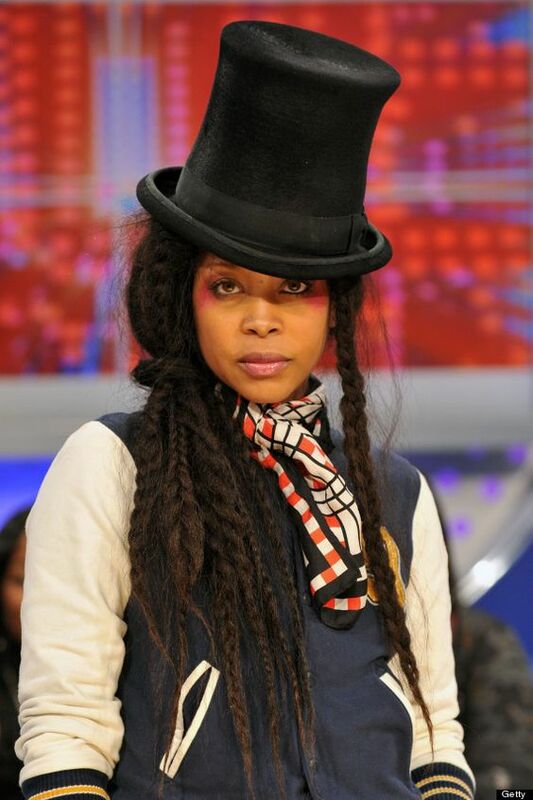 A hip, bold look is created to match your chic sense of fashion. You will look gorgeous during the day and well into the night. 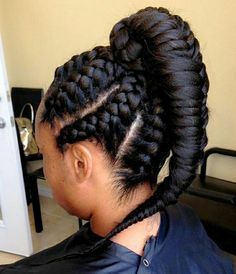 If you desire to have a unique up-do, don this impressive style. 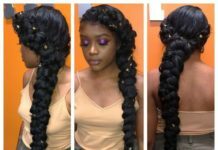 Craft the braids atop your head and create a single braid in the back. A distinct up-do to wear for any occasion. 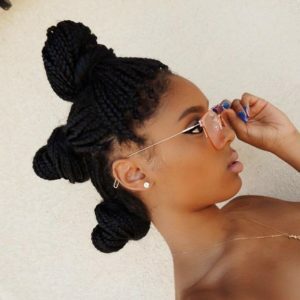 High buns have quickly become one of the most popular hairstyles. Ultra-chic looks are crafted and adorned with hair jewelry. You are sure to dazzle and delight as your tresses sparkle with lovely hair jewelry. A one of a kind hairdo is created with purple tresses and designs shaved onto the side of your head. 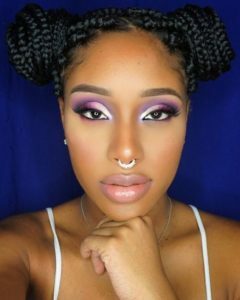 Wear your tresses in a high bun to showcase the unique designs. Achieve an effortless look when you craft a reverse French braid. A sophisticated up-do is created to wear to fancy dinner parties or classy restaurants. 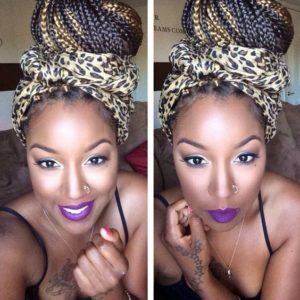 This goddess braid is wrapped into a tall bun to showcase your beauty and grace. 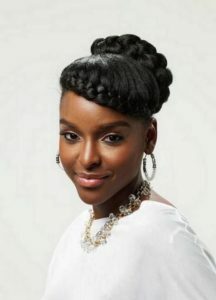 This up-do can be worn for casual or formal events. Bold or delicate jewelry will highlight the exact vibe of this up-do. A thick braid is crafted with your tresses. The braid gets thinner and ends in a cute curl. This up-do is perfect for the office or a fancy occasion. Craft three buns atop your head for a unique, ultra-chic look. Be sure the buns are of equal thickness for a cool look. You will be stylish everywhere you go. An up-do is the perfect time to don a two-tone hairstyle. Up-dos emphasize the two colors throughout your tresses beautifully. 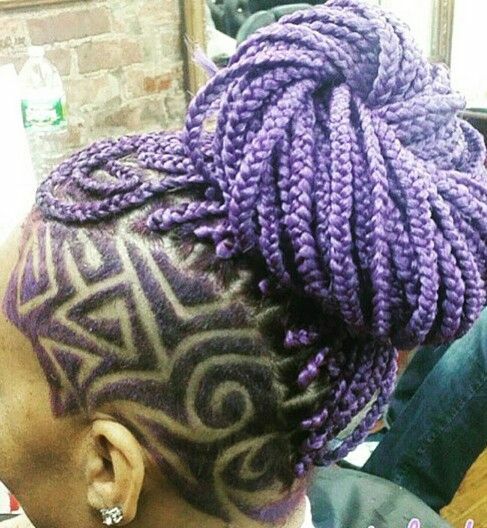 Natural or bold colors can be added into your braids to match your sense of style. A graceful look of dignity is crafted with this elegant up-do. Be the epitome of sophistication as you adorn your tresses with classy hair jewelry. A scarf adds a Bohemian chic vibe to your ‘do. As you wear your tresses up, add a scarf to jazz up your hairstyle. For a modern look, don braids pulled into a high ponytail with a three-tone color addition. 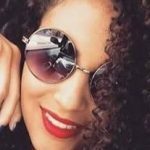 The braids end in curls creating an elegant style. Wear this up-do to the next formal event you attend. 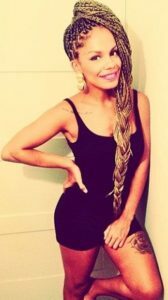 Long box braids provide you with versatility. 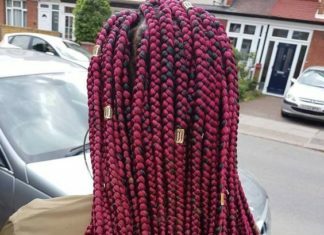 Creative hairstyles can be crafted with these long box braids. 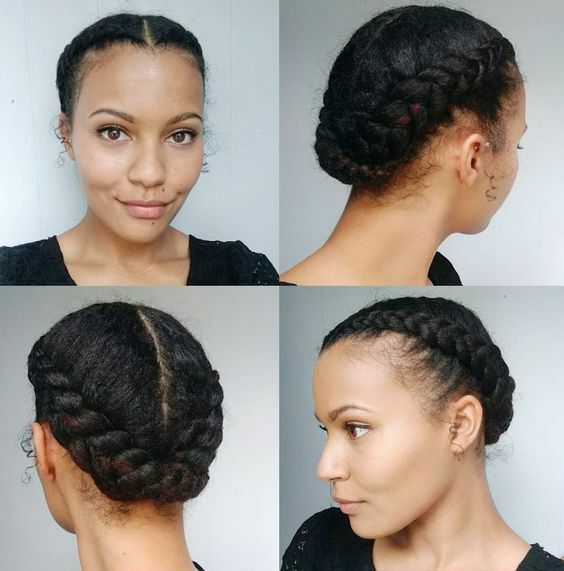 Up-dos showcase the length of your braids perfectly. 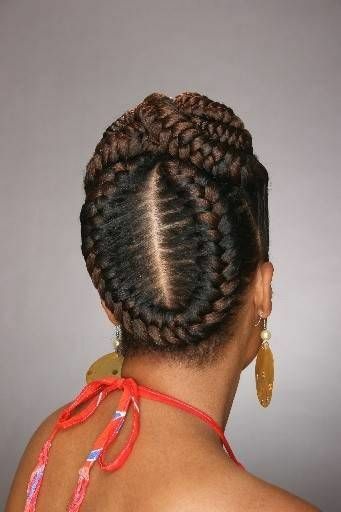 Height and beautiful braiding allow your up-do to stand out. 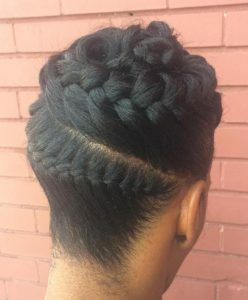 A high bun with French braids and Dutch style cornrows is a one of a kind ‘do. Wear an elegant gown with this classy up-do. Don a hairstyle as unique as you. This long Mohawk braid has elegance and edge all rolled into one long braid. Wear a sophisticated gown or an edgy outfit with this modern Mohawk. 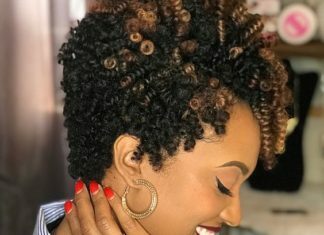 Time and patience help to achieve this marvelous ‘do. An impressive asymmetrical wrap at the neckline is achieved due to each braid being coiled on its own path. Walk confidently into a formal event as you don this gorgeous up-do. An elaborate and sophisticated hairstyle is crafted when braids interlace with twists. Your tresses are a work of art impressively braided to perfection. Be the artist of your tresses and craft an original up-do. 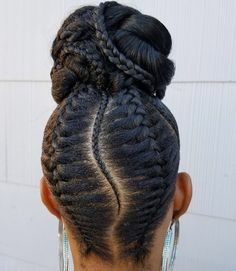 The double braided Mohawk up-do is classy and modern. A touch of edge is added through a Mohawk style. 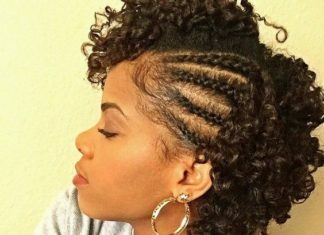 The curls at the ends of the braids add sophistication to this ‘do. This Mohawk can be worn to classy dinner parties or for a night on the town.